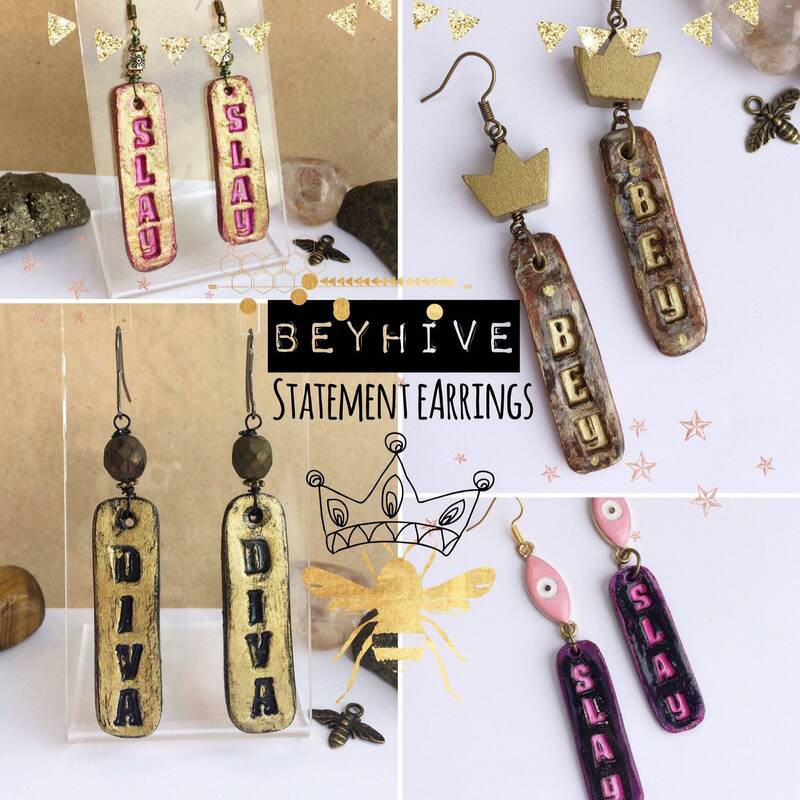 More from my BeyHive range which I am having so much fun making. 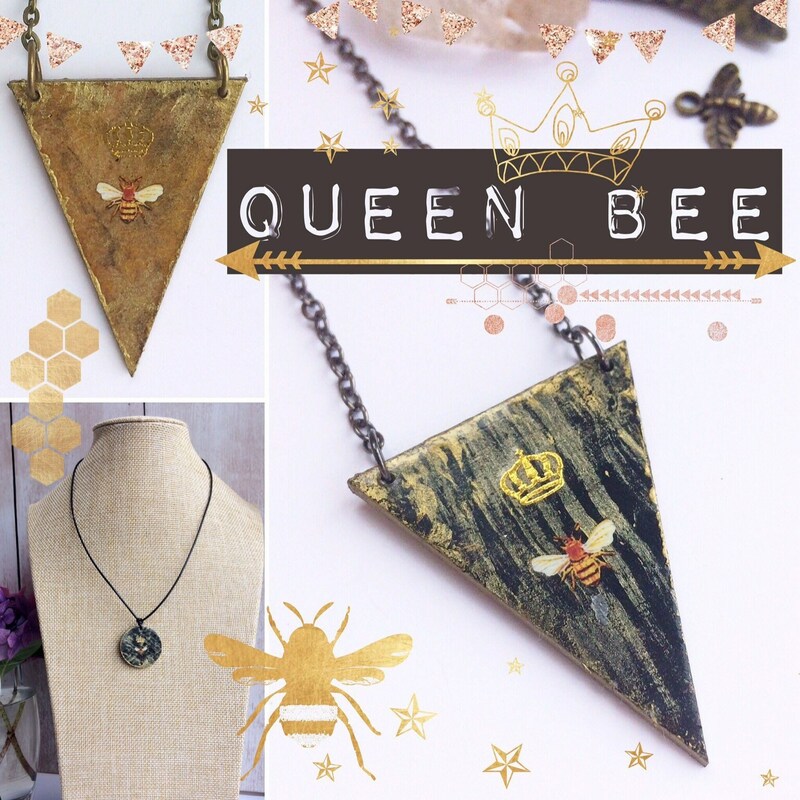 Here are several necklace designs all featuring the 'Queen Bee' motif. I've numbered the designs on the photographs and provided a brief description of each below. 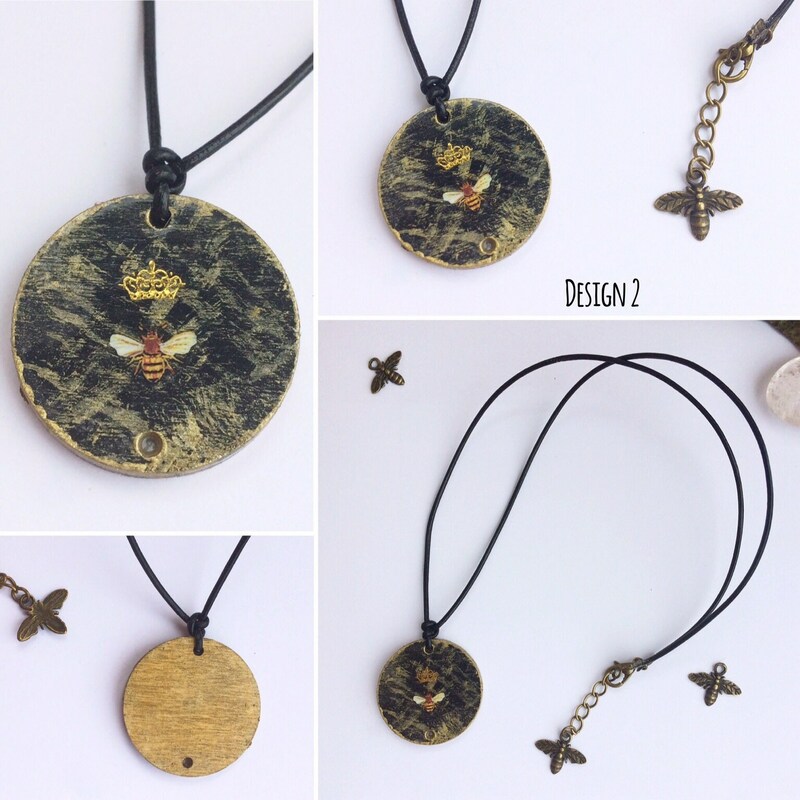 I've also included pictures of some other bee pieces from my 'BeyHive' shop section. 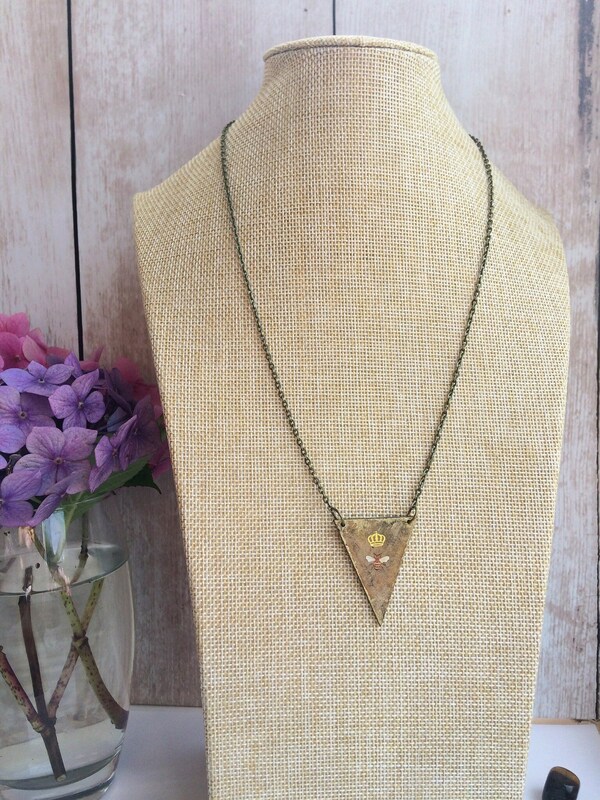 Design 1: Wood triangle pendant & antique gold long chain. The pendant is a triangle, 3cm long at the top, 4cm long and 2mm thick. 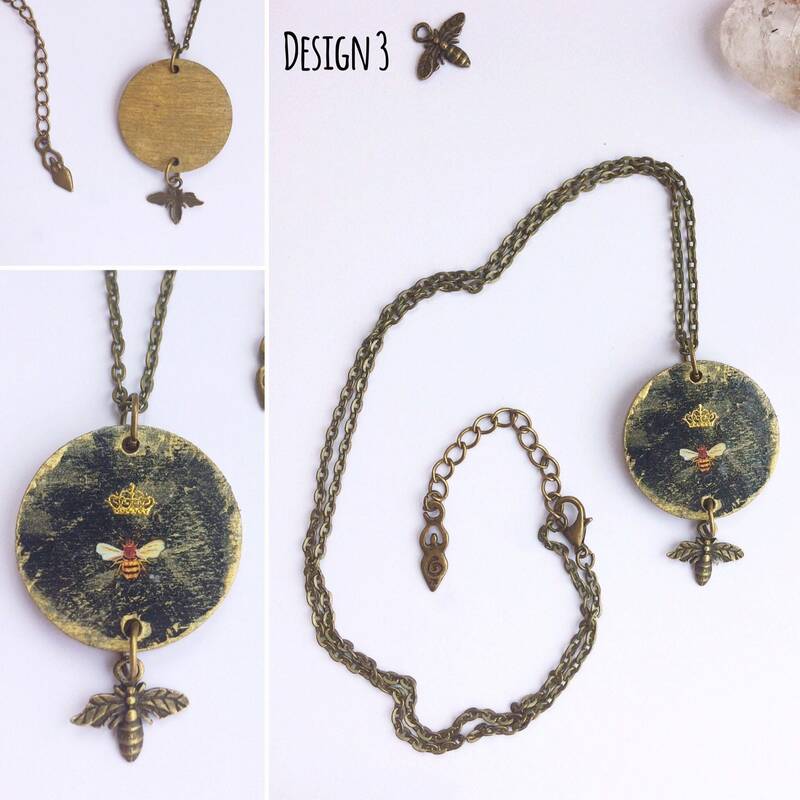 The antique gold coloured chain is 56cm (22") and has a 12mm bee charm at the close. It hangs at around upper chest length. Design 2: Black round pendant on leather thong. The pendant is 3cm wide and 3mm thick. This is thrice varnished to protect it. 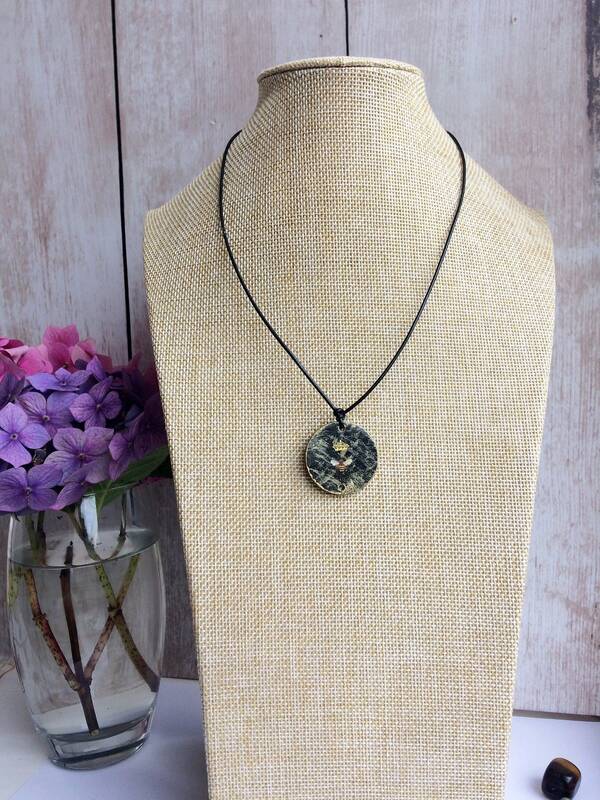 This is affixed to a black leather thong 44cm (17") with a antique gold extender chain with bee charm sized 12mm. This means the fit is adjustable up to 46cm (18"). 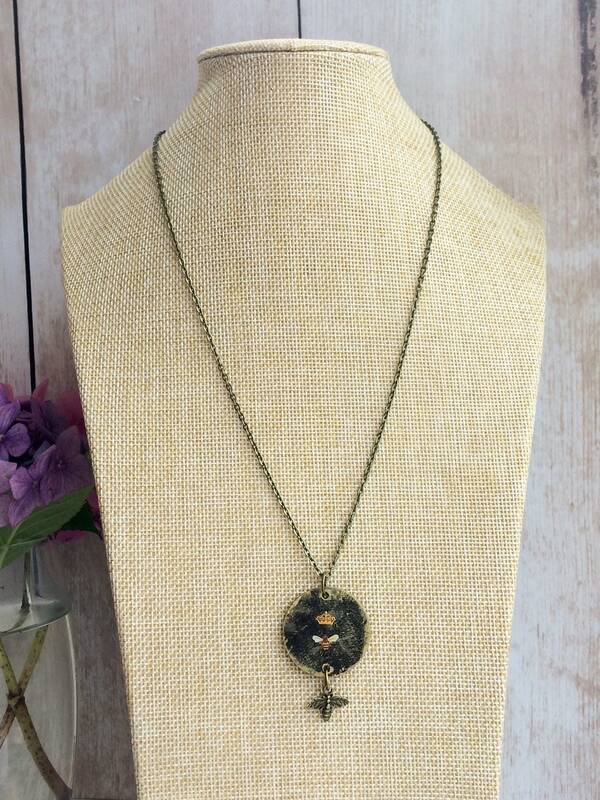 Design 3: Black pendant on chain. The pendant is 3cm wide and 3mm thick. 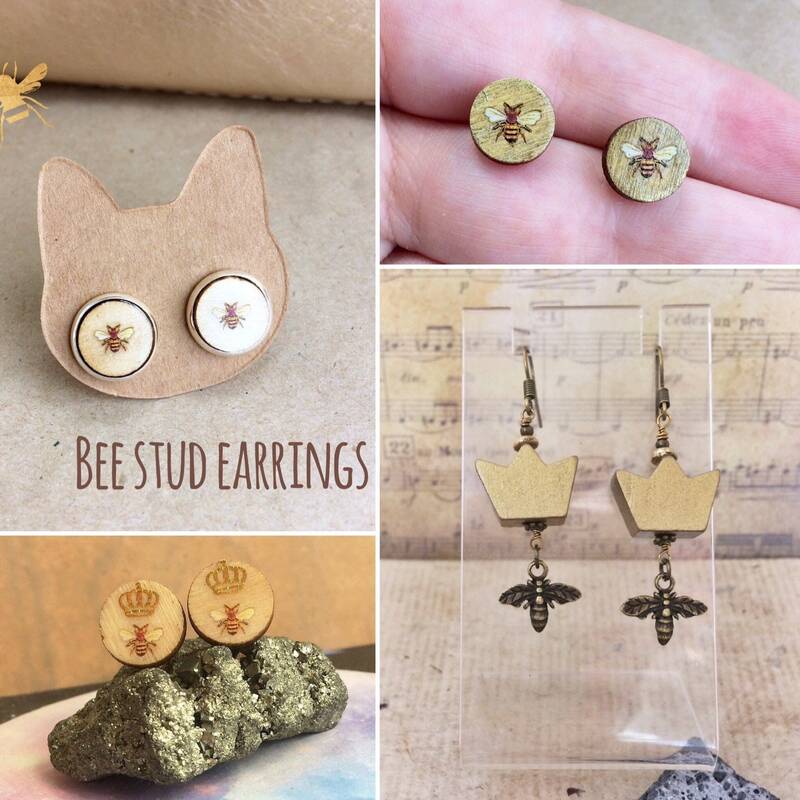 It has a antique gold bee charm sized 12mm. I noticed after I photographed this that the bee has a injured wing (!!) so I will fix that before sending. The total drop length of the pendant plus bee is 4.9 cm and the chain is 54cm (21") at the shortest length, but there is a 5cm extender chain meaning you can adjust the length. It hangs at around chest length. The extender chain has a goddess charm because we are all Queens! 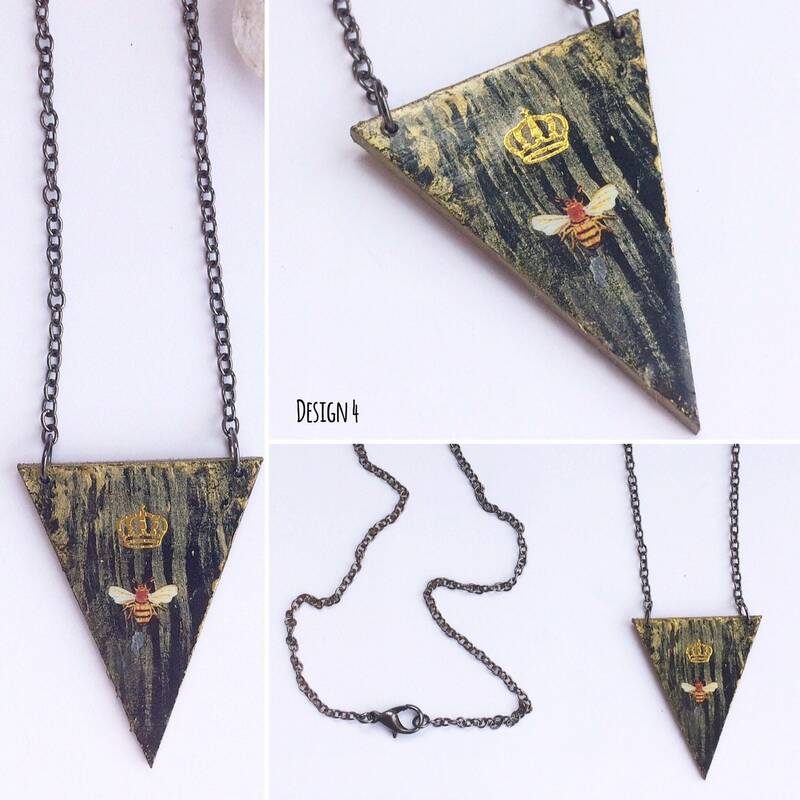 Design 4: Wood dark triangle pendant on black chain. 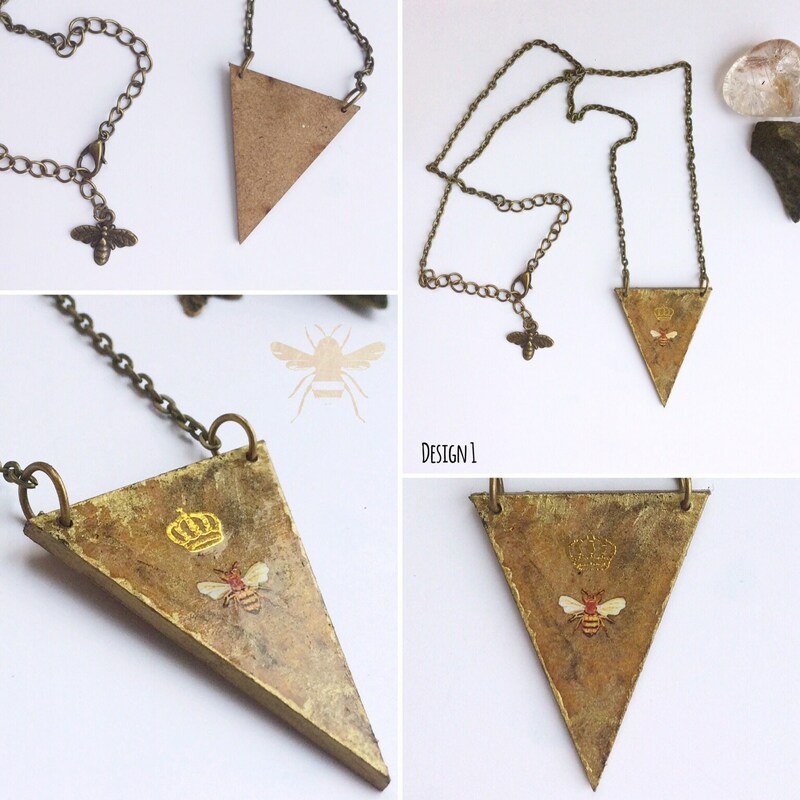 The pendant is a triangle, 3cm long at the top, 4cm long and 2mm thick. This is thrice varnished to protect it. The gunmetal black chain is 60cm (23").